Windy melodrama set among among storm chasers and tornadoes. THIS post-“Jurassic Park” SFX bongo fest must have had 90s studio execs all in a tizz when the idea was pitched. 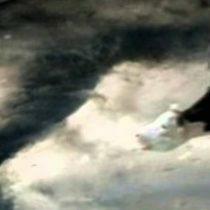 Attached to Spielberg‘s Amblin, directed by Jan de Bont hot off of “Speed“, the idea that they could toss the audience into the middle of a 300-mph twister and have them bombarded by airborne, cartwheeling trucks and confused cows, the money men gleefully opened their chequebooks. 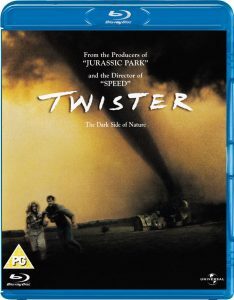 And “Twister“, to give it a little credit, still looks pretty good considering CGI advances over the past two decades. Wind tears and powers through towns and buildings, wasting everything in its way mercilessly. You can see where the budget went, because it certainly didn’t go on the script. Meanwhile, Paxton’s fiancee, tagging along for the ride (as exposition for us so we can learn all the weather-related techno-babble), begins to see her new beau’s old passion for stormchasing returning – and maybe he still loves his ex too. All this while tornadoes pop up left, right and centre to keep us from nodding off with scenes of mass destruction. Oh, such things classic films are made of. But “Twister” is no classic. FX aside, it’s main interest these days is as career cemetery. Bill Paxton has passed on. Ditto a very young Philip Seymour Hoffmann, while the careers of Jan de Bont, Helen Hunt and Ferris Bueller pal Alan Ruck have not really gone anywhere in the intervening years.